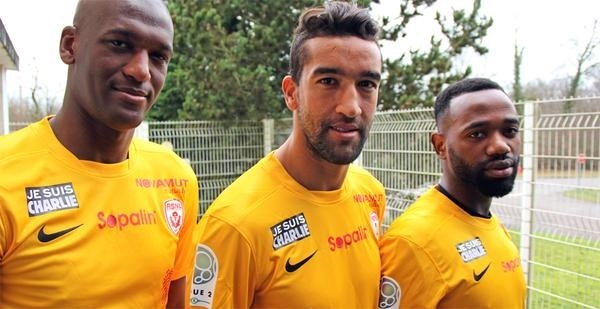 (L-R) Nancy players Joel Sami, Youssouf Hadji and Lossemy Karabouue wear “Je suis Charlie” patches. Contrary to what you may have been told, a condemnation of the self-proclaimed Muslims who killed 17 people during three days of gun violence in France last week is not equivalent to an endorsement of the insulting and offensive depictions of the Prophet Muhammad (peace be upon him) by French magazine Charlie Hebdo that ignited the attacks. Contrary to what some people believe, a Muslim can still be offended by those cartoons while opposing the idea that people should lose their lives for publishing them. In other words, you don’t have to like what Charlie Hebdo does in order to hate what happened at their headquarters. In 2015, it is tragedy and not triumph that has brought a nation together. It is estimated that nearly 3.5 million French took to the streets on Sunday to march for unity and peace. On the football field, too, there has been room for reflection. At every Ligue 1 and 2 ground over the course of the weekend there were respects paid to the victims of an act that has touched France more acutely than any other in generations. Olympique Lyonnais’ fixture against Toulouse was even moved to allow spectators to gather at an afternoon rally. For once the television companies, so often unyielding in their demands, assented. While the ubiquitous ‘Je Suis Charlie’ slogan appeared at grounds all round the country, an allowance was made for those who felt their political opinions were not accurately represented by wearing it emblazoned on their kit. On Monday evening, meanwhile, three Valenciennes players taped over the ‘Je Suis’ part of the phrase as their side went down 2-1 at home to Sochaux in Ligue 2. It was a subtle and apt way to show support for the victims and the right to free speech, while protesting the politics of the magazine and the state of the nation. Youssouf Hadji, a Muslim from Morocco who plays forward for Nancy in Ligue 2, summed up the thoughts of millions of Muslims around France and around the world. “As a Muslim, I am completely destroyed,” Hadji said. “These killers have nothing to do with Islam, which prohibits the taking of life. The Quran reads opposite to what happened yesterday.